Create a dazzling look for your event with 90" x 132" big payette sequin rectangular tablecloths from Balsa Circle! Each order is for one (1) rectangular tablecloth. Sequins size: 0.7" or 18 mm. Material: Mesh base covered with big shiny round sequins. Fabric Care: Do not dry clean or machine wash. Wipe with a soft damp cloth. 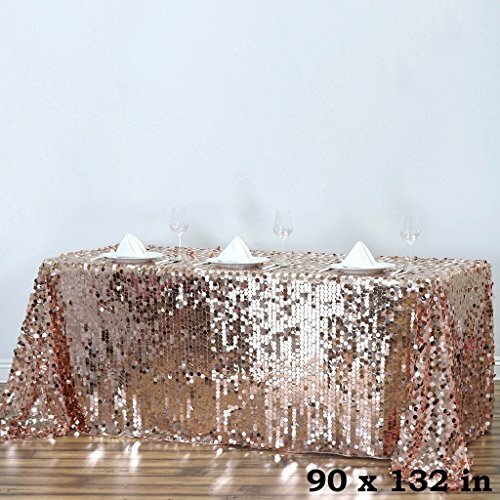 Our new sequin rectangular tablecloths will help you create an elegant and unique look for your event! Perfect for special occasions or events, this tablecloth with rich texture will beautifully dress up your tables. Dress up your tables with 90x132" rectangular extra large payettes sequins tablecloths and create a gorgeous display! Pair these beautiful tablecloths with other BalsaCircle decorations, such as table overlays, runners, napkins, centerpieces, chair covers and sashes.